The Geo Trade Blog: A New Wall on the US-Mexico Border, for what purpose? 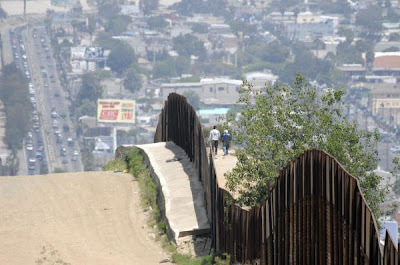 A New Wall on the US-Mexico Border, for what purpose? migrating desert dunes begin to bury it. Since 2005 the US Government has been building a US-Mexico Border Wall. The US-Mexican border follows the Rio Bravo through the rough terrain of the Big Bend and through the once busy trading posts of Presidio/Ojinaga and on to the El Paso/Ciudad Juárez twin cities (on each side of the border) established as the "Passage to the North" between the mountain ranges, from there, the river gives way to the new wall. The primary purpose of the Great Wall of China was not to keep out people, who could scale the Wall, but to insure that semi-nomadic people on the outside of the Wall could not cross with their horses or return easily with stolen property. A border marks the place where adjacent jurisdictions meet. This combined conjunction and separation of national laws and customs creates a zone in which movements of people and goods are greatly regulated, highly examined and sometimes hidden. Commerce attains a higher importance on both sides of the border. Smuggling, legal and illegal immigration, add to a picture of accentuated concern with the trade in goods and the flow of people. The border is an environment of opportunity. Individuals find work enforcing or avoiding the laws that regulate movement and goods. Companies use national differences in labour and regulations to pursue their advantage. Borders thrive on difference and people and institutions come there to exploit niches. 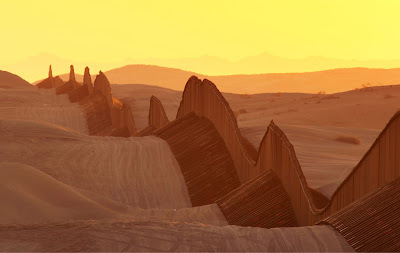 By building a wall along the border, the psychological barrier between two different jurisdictions is physically manifest as a structure that seeks to distinguish and separate the two sides. The US-Mexico border has frequently been transited in history for the mutual advantage of both countries. For example, during the Second World War, when the US was badly lacking in labour, it launched a programme to encourage large migrations of Mexican workers to the US to work legally as contract labourers for seasonal work. In more recent times, since the signing of the North American Free Trade Agreement (NAFTA) labour unions of Mexican farmers, service employees, and oil workers now organise maquiladora workers at the assembly plants on the Mexican side of the border. What purpose does the wall serve? The Obama administration has been under intense pressure to beef up security on the border to prevent the recent increase in drug-related violence in Mexico spilling into the US. One of the ways to do this was through "virtual policing" of the wall by lining the border between the US and Mexico with cameras and radar towers as shown in the diagram above. This was supposed to be a cost effective way of policing the wall. However, in February 2011, the Obama administration finally pulled the plug on what was known as the "Virtual Wall". After spending more than $1 billion on the scheme, the US Department of Homeland Security was forced to admit that it was a "complete failure". But building of the physical wall still continues. Since 2005, the Wall covers around half of the 2000-mile US-Mexico border. Even so, it is not clear what purpose the wall serves. It can be easily scaled within 20 seconds by a person as shown in YouTube videos. 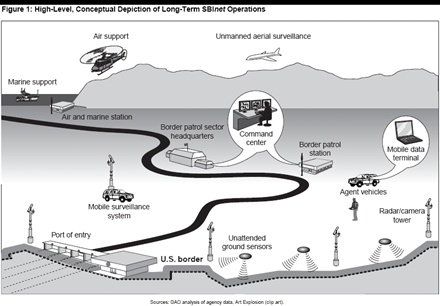 The US Government (without cameras and radar) will not have the resources to police all 2,000-miles of the Border Wall. Earlier on this year there were reports that people were using medieval catapults to thwart it. Smugglers trying to get their goods across the wall were trying a new approach – a medieval tribuchet catapult installed on a flatbed towed by a sports utility vehicle to launch projectiles across the new wall. This only serves to illustrate that human innovation will not be stifled by a wall. People will constantly seek out new ways for goods and people to go under, over and around it. 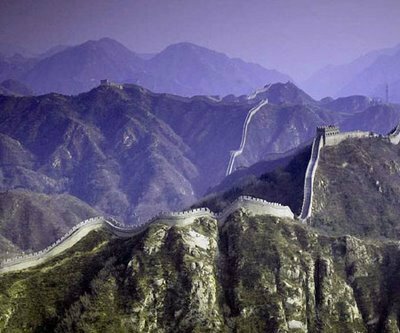 The US-Mexico Border Wall seems to lack a clear purpose compared with the Great Wall of China which was built with a clear primary purpose, to ensure those outside could not easily cross and get back across with stolen property. In the 21st century, the US and Mexico's economies are highly dependent on each other. They are not enemies where one is stealing from the other. Instead, they are trading partners within NAFTA. Mexico sends the lion's share of its exports to the US. Mexico is the second-largest export market for the US and it is the US' third-largest trading partner. Mexico also supplies US companies with much human capital both within Mexican borders and across the border in neighbouring US states. It would appear that erecting a wall has more to do with an 'imagined fear' than a real need to protect against maruading intruders from the South.